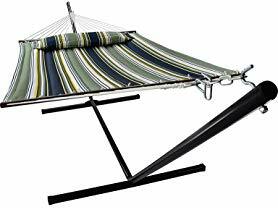 Today only (9/8) this Sorbus Hammock with Spreader Bars, Stand and Detachable Pillow is just $99.99 (Reg. $149.99)! Enjoy a relaxing moment with the Sorbus Hammock! Enjoy every minute of your leisure time. Spend the day reading on the deck or relaxing by the pool. When you're ready to re-locate, detach the hammock from the frame and transport it to your next camping trip, vacation home, or exotic destination. The possibilities are endless!